If you’ve been keeping an eye on TeamPlatform, you know that we are a company where innovation never rests. 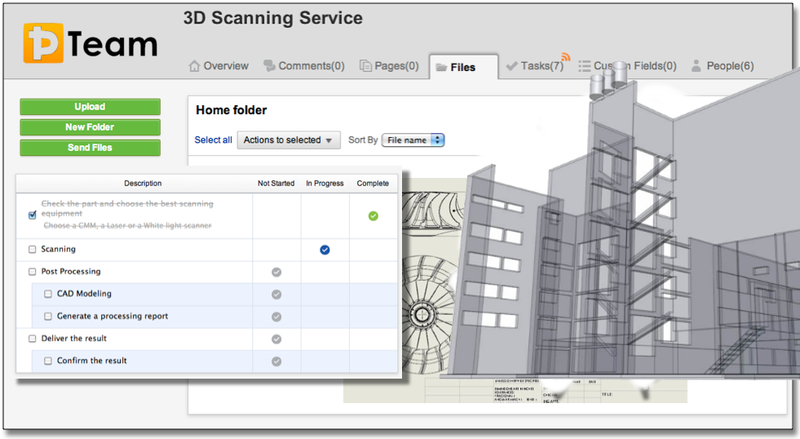 We were the world’s first company to provide online, plug-in free project collaboration, data management and online viewing for native 3D CAD models, the first company to provide online workflows for managing 3D reverse engineering projects, and our recent addition of online 2D vector drawings support is much more than a drop in the bucket. Combined with best-in-class online data and collaboration tools for sharing, managing files, planning tasks, and communicating with others, TeamPlatform is one powerful animal. The implication of our latest release is nothing less than a major-league impact. Real-world laser scanning projects (GB’s to TB’s of data) can be managed online with new TeamPlatform’s development which supports FARO Laser Scan point clouds. Online Measurement, Markup and Annotation, Scan-Data Meta-Data Extraction, and various Online visualization capabilities including top plan-view visualization and full 3D visualization are enabled with the release. New point-cloud capability seamlessly integrated with existing online collaboration project management tools, including file version management, password-protected web-publishing, full audit-trail, and Online views of images, video, and 2D & 3D CAD to seamlessly supplementing the new development. Just how big are Laser Scanner Point Clouds? Most of the time the answer lies between Big and Really Big. A single scan pass from a laser scanner can easily exceed 50,000,000 points. 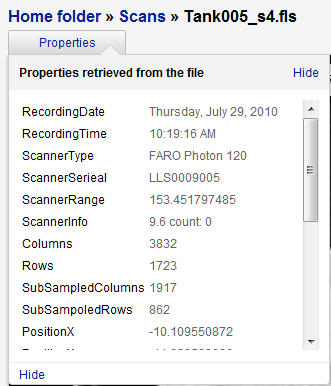 Scanning a small object, like a vehicle, might only take 4 scans. 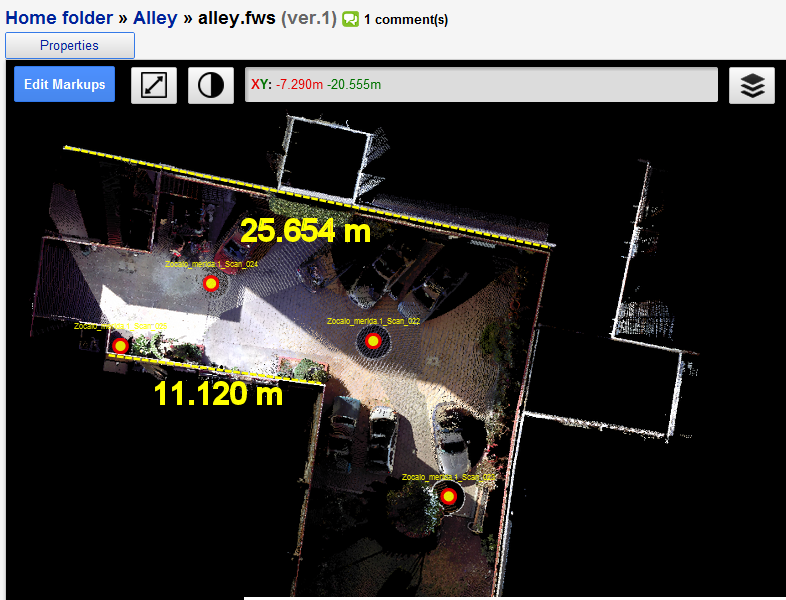 Scans of larger objects like buildings or survey sites quickly add up. Even with industry-standard high-compression, it is not uncommon to acquire Gigabytes (GB’s) if not Terrabytes (TB’s) of scan data taken during a single scanning project. Not only does laser scan data carry with it billions of points that capture details that would be impossible to record any other way, it brings with it large data that requires highly specialized software to view, measure and manage. 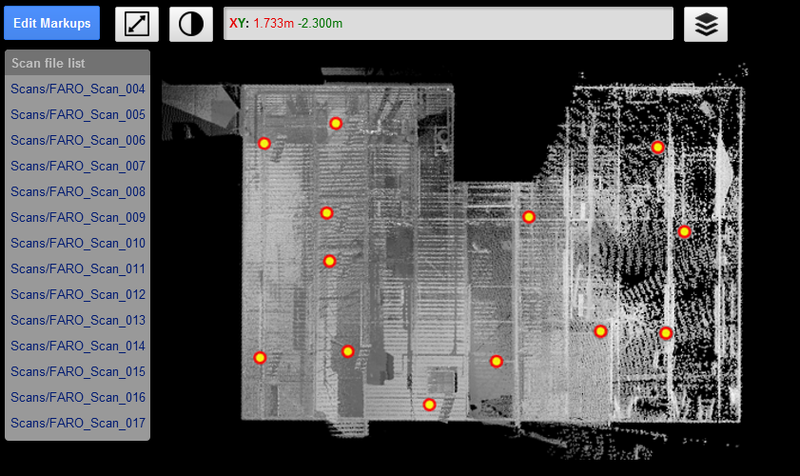 You wouldn’t even think about loading 3D laser scan data into a web-browser, until now. 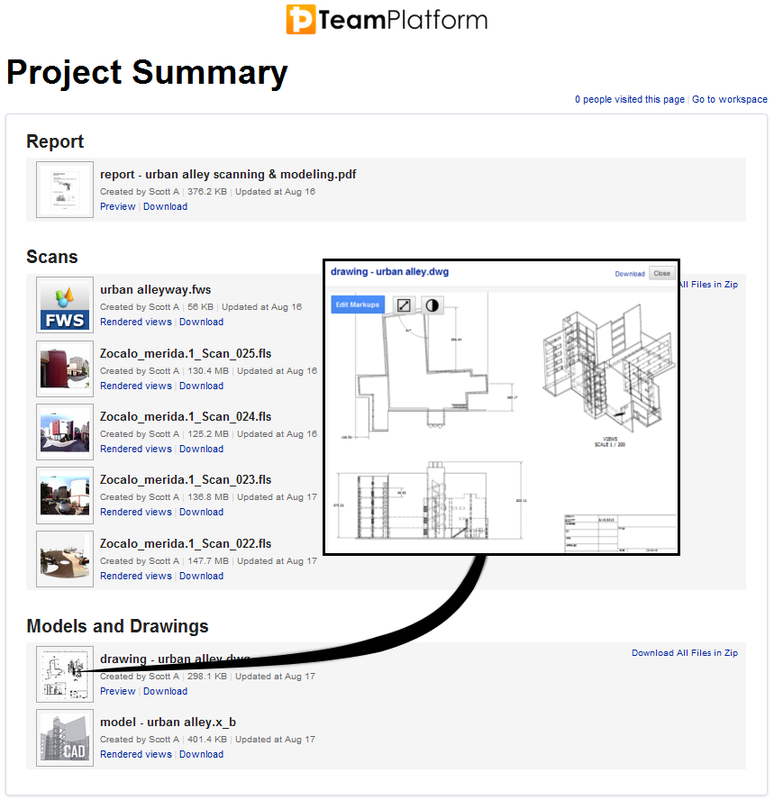 Courtesy of your web browser and entirely online, TeamPlatform provides powerful 3D project execution capabilities such as task and workflow management, accessibility control, meta-data management, and revision control of CAD, drawings, documents, photos and videos, and now an a new innovative way to deliver 3D coordinate information from massive 3D scan data lightly and quickly to your web browser. How can you manage huge data? Upload it then forget about its size. You don’t need to worry about the data swamping your hard drive or workstation after it has been uploaded. Once online, you have the ability to visualize, measure, markup, annotate, and most importantly easily search, archive and distribute data from laser scan projects. 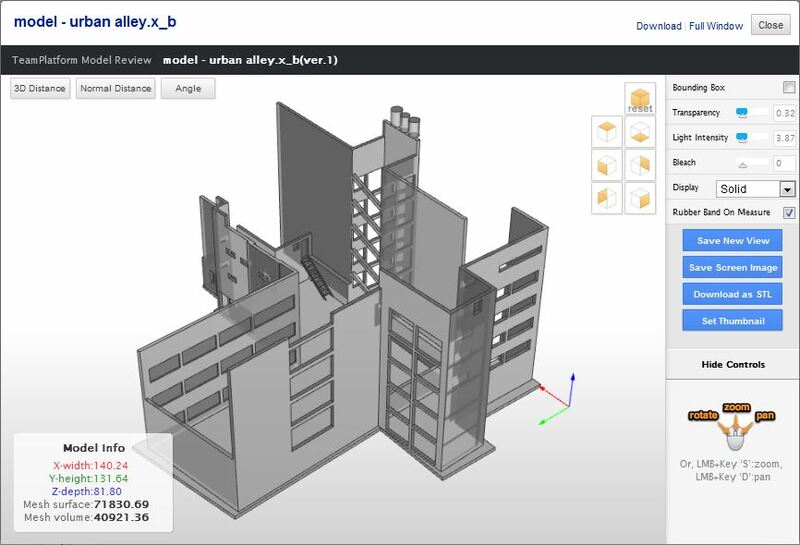 All of the collaboration and project management tools within TeamPlatform are readily available to use side-by-side with the new point-cloud features. Granting access to project data to others is simple: invite them by entering in their email address. Hosted entirely online, data is automatically backed up on TeamPlatform cloud servers meaning you can search for, visualize, check markups and download old-revisions instantly. With our secure, high-performance cloud, the speed of data access across-county or across-continent is blazing. 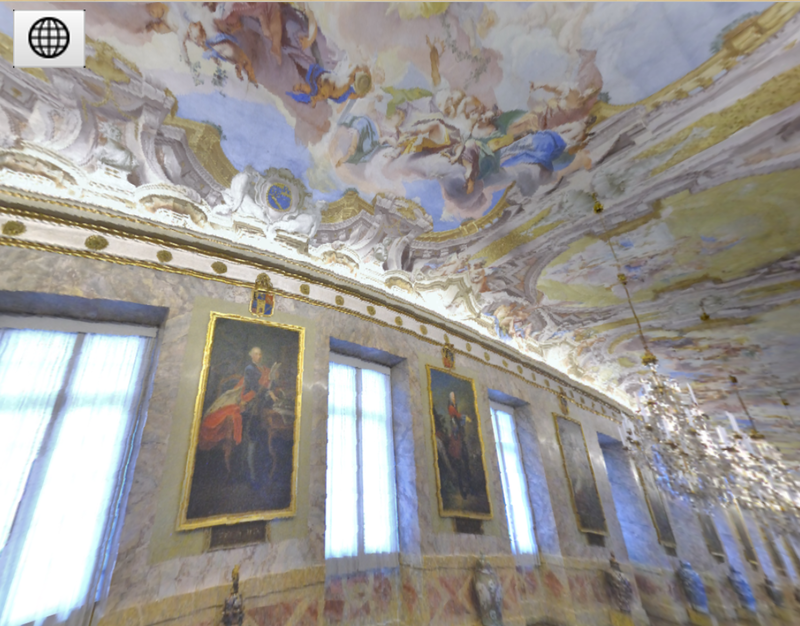 Visualization, measurement, and markup of point-cloud data is innovatively lightweight and fast, so you and other stakeholders (other clients, partners) can work with GB’s and TB’s of data even with meager internet connections and marginal workstations very easily. Anyone granted access to a project workspace has blazing-fast access to the pulse, plans and point clouds of the project. TeamPlatform is an online software, so you will never need to download service-packs, install software, or administer and maintain expensive server hardware, and neither will the people you are working with. Everything is kept up to date and everyone stays on the same page when working with massive data sets, simply and easily. All data, markup, previews, annotations, discussion (a full audit-trail) is stored and backed-up online on TeamPlatform. You’ll never need special software to access the project data, only a web-browser and an internet connection. 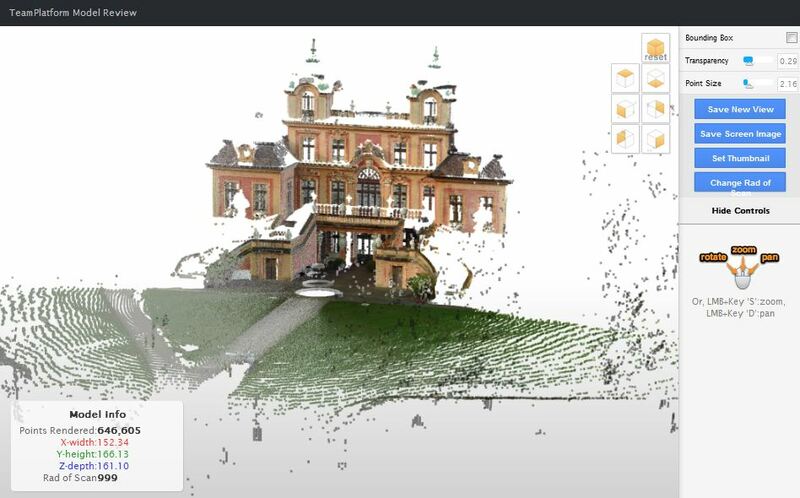 Point cloud handling is currently available with native FLS and FWS scanners. 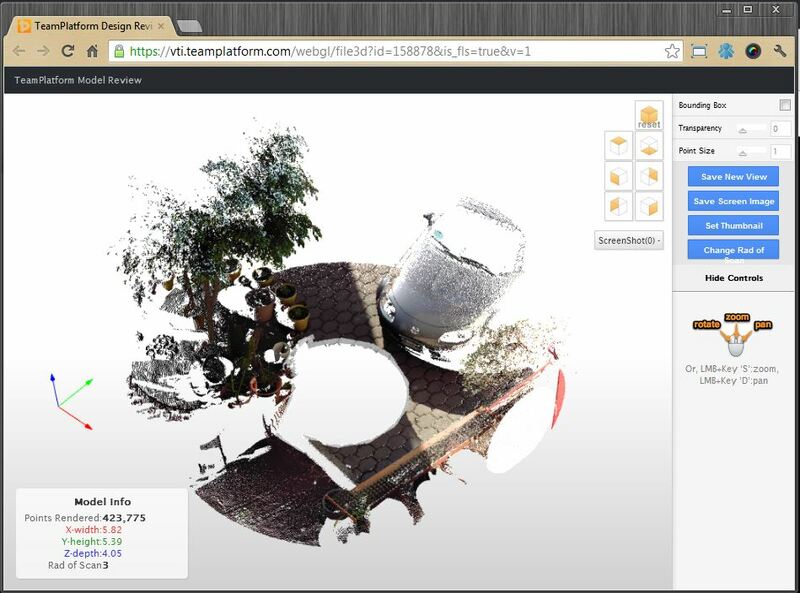 Online FLS support provides full 3D, spherical and planar views of point-cloud data. 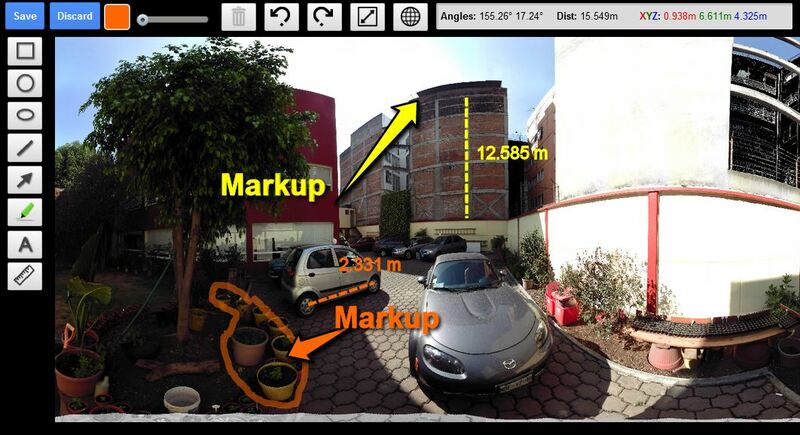 Within planar view, you can take 3D measurements and add markups like highlights, text and call-outs. In spherical view, you are instantly immersed in scanning environment providing a full 360 x 360 perspective of the scanning environment. The 3D view is nothing short of full 3D: you can zoom, pan, rotate, save viewpoints, and adjust point rendering size and transparency while viewing the 3D point cloud. 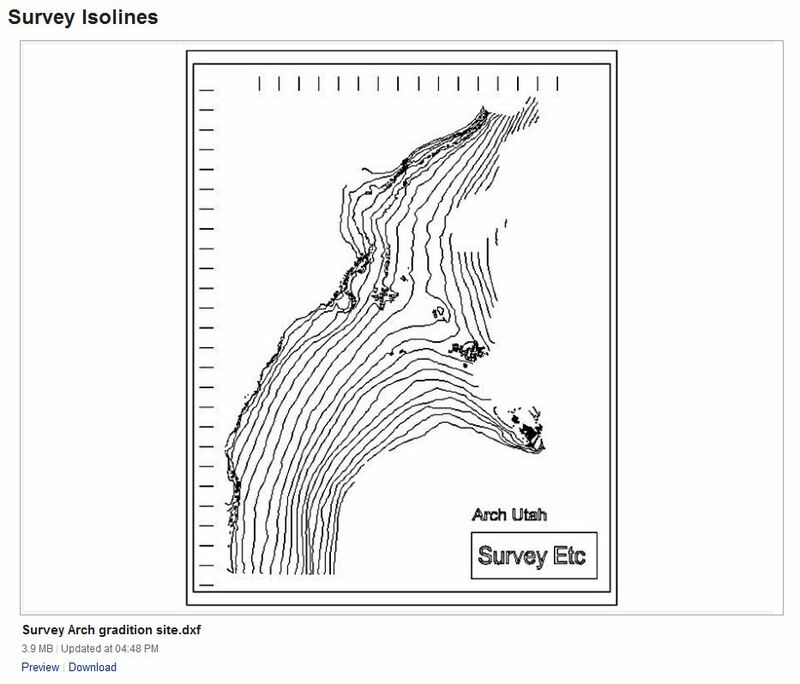 Online FWS support provides a top-down (or plan) view of all scan layers and allows for markup and 2D x-y measurement from the top down view, which is perfect for taking measurements of the as-built site-plan. To convert files to TeamPlatform viewable format, simply upload them to TeamPlatform. Conversion starts instantly, takes seconds to complete and is completely automatic. The file data is preserved and unchanged. By converting the file to TeamPlatform viewable format, your files can be viewed online. Full-screen mode is available in all online views. 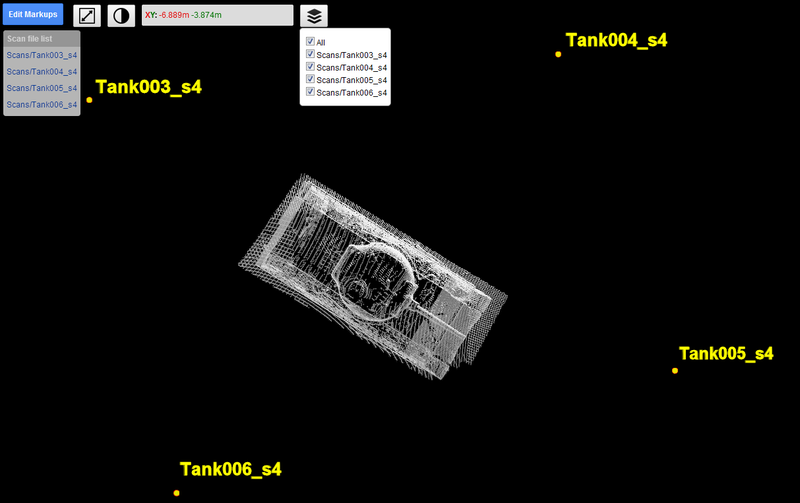 Mobile devices (Android/tablet, iPad/iPod) support Planar and Spherical views of point cloud data. With a powerful way to handle 3D projects and now a powerful new way to share, visualize, measure, and markup point clouds online, you can get more done more quickly with TeamPlatform. 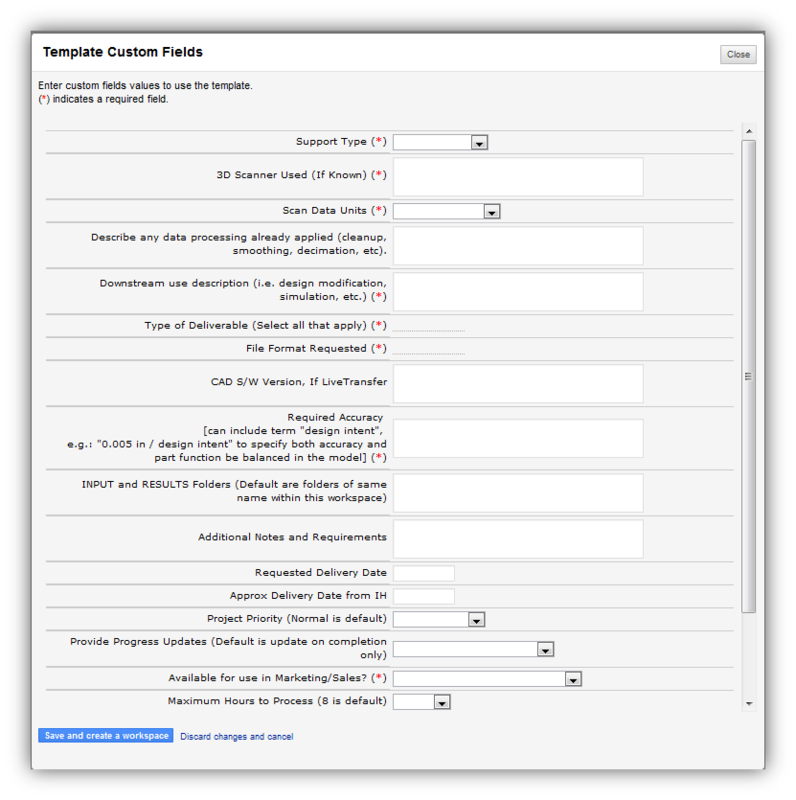 Leveraging project initiation, planning and execution tools in TeamPlatform has never been easier. Models, topological surveys, and video-fly through deliverables can be managed side-by-side with the data, people, and even the service request that initiated the project in the first place. Get online and get projects done with your own data.